Transport for London plans to cut the number of lorries during peak hours and to test equipment on buses to help drivers spot cyclists and pedestrians. 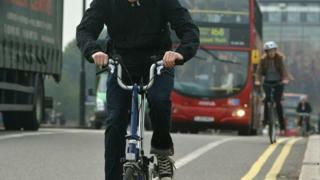 TfL is aiming to cut by 40% the number of people killed or seriously injured on roads by 2020. Last year 132 people, included 65 pedestrians and 14 cyclists, were killed on London roads. The proposals are part of London Cycling Design Standards, which will consulted on later this year. Six cyclists have been killed in the capital since January. Figures released by TfL on Wednesday showed 2,324 people were killed or seriously injured in London in 2013-14, a 23% drop on the previous year. Of these, 489 were cyclists. TfL said it would try to reduce the number of lorries on the roads during peak hours to reduce "interaction" with cyclists. It will also work to install technology to make lorries quieter, enabling more off-peak deliveries to be made. It also plans to trial detection equipment on buses, helping drivers be more aware of pedestrians and cyclists near their vehicles. Measures to monitor the top speed of buses could also be introduced. TfL also hopes to work with lorry manufacturers to develop better side guards to prevent cyclists being dragged under the vehicles' wheels. It plans to train 10,000 freight and fleet drivers and double the number of adult cyclists taking advanced safety skills training by 2020. Andrew Gilligan, the mayor's cycling commissioner, said the proposals were aimed at delivering the cycling infrastructure promised by London Mayor Boris Johnson. Leon Daniels, TfL's managing director of surface transport said about 600,000 cycle journeys were made every day across London, the equivalent of almost 10% of daily bus journeys and about a fifth of Tube trips. "These proposed revisions to the London cycling design standards, as well as the revised cycle safety action plan, will help us further encourage more to take to two wheels, while ensuring that they can do so in the safest and most direct way possible," he said.